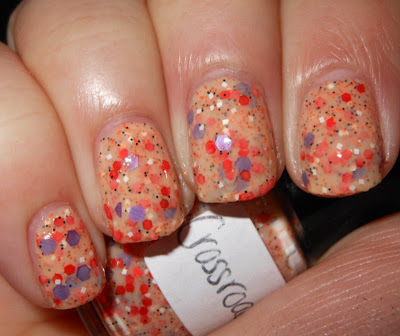 Two Birds One Store is an indie polish brand brought to you by the blogger See Sarah Swatch. She is an amazing frankener. Before Sarah even opened up her indie shop she created Neptune's Pool for me based off my polish idea. Also, once she opened shop I bought the pretties Once Upon a Time and American Beauty from her. She's very talented and creative. Sarah recently asked me to review some of her newer polishes from her shop, and I happily obliged! Something Wicked is a red toned violet jelly base mixed with red, red holo, purple micro glitter, and white hexes. Who Ya Gonna Call? is a light gray base with a fine white micro shimmer mixed with blue, white, and black matte glitters. Crossroads is a white-orange jelly base with black and orange micro glitters, white squares, and larger purple and orange hexes. Queen of Shades is a red jelly base with subtle violet shimmer mixed with small salmon glitters and purple and blue larger hex glitters. These glitters are all so creative and fun. The formula really stood out to me in these polishes. I had absolutely no trouble getting the glitters out in these. They stuck to the brush, and spread out on the the nail so easily. I've never had glitters polishes from an indie brand apply so well, especially glitters of this variety and size. I will say with Crossroads and Who Ya Gonna Call? the amount of glitter in them along with the size of the glitters will leave you with a grittier finish, so I recommend using two coats of topcoat over those two. I have no complaints otherwise! Awesome polishes! You can purchase Two Birds One Store polishes from Sarah's etsy shop for $8 for full size and $4 for minis. You can also follow her shop on Facebook. *I received these polishes to review from Two Birds One Store. Wow, I really like all of those! They are fun combinations that aren't overdone! 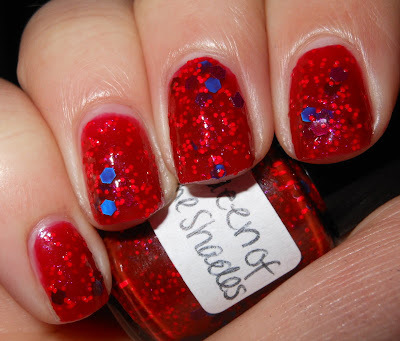 Love Queen of Shades, really unusual combination! Wow, Queen of Shades really stands out! So unique and such rich colors! all so fun but I love something wicked! These are awesome! Definitely different. Nice polishes, but unfortunately their shipping rates to Canada are higher than other stores, so I won't be buying. Something Wicked is so pretty! And I am not even a big fan of purple!